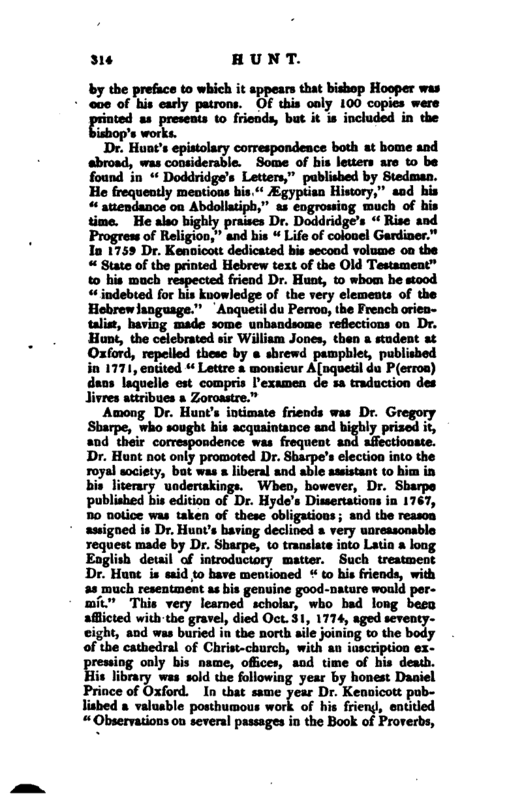 , a learned Hebraist, and Regius professor of Hebrew, Oxford, was horn in 1696, but where or of what parents we have not been able to learn, or indeed to recover any particulars of his early life. He was educated at Hart-hall, Oxford, where he proceeded M. A. in Oct. 26, 1721, and was one of the first four senior fellows or tutors, when the society was made a body corporate and politic under the name of Hertford college; and he took his degree of B. D. in 1743, and that of D. D. in 1744. His first literary publication, which indicates the bent of his studies, was “A Fragment of Hippolytus, taken out of two Arabic Mss. in the Bodleian library,” printed in the fourth volume of “Parker’s Bibliotheca Bibiica,” 1728, 4to. In 1738* he was elected Laudian professor of Arabic, which he retained the whole of his life, and was succeeded by the late Dr. Joseph White. In the following year he delivered in the schools, a Latin speech “De antiquitate, elegantia, utilitate, Linguae Arabicae,” published the same year; and another “De usu Dialectorum Orientalium, ac praecipue Arabicae, in Hebraico codice interpretando,” which was published in 1748. In 1746 he issued proposals for printing “Abdollatiphi Historias Ægypti compendium,” with a full account of that work, which, however, he never published. 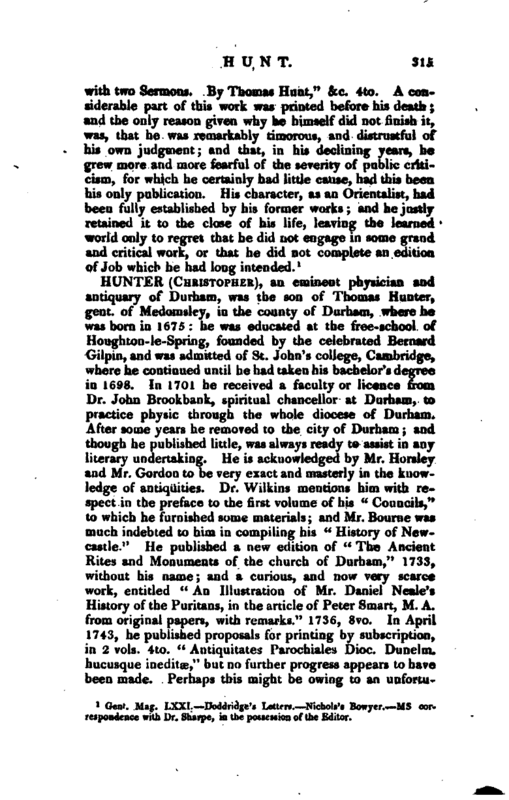 The subscribers were recompensed by receiving in lieu of it his posthumous “Observations on the Book of Proverbs,” edited by Dr. Kennicott after his death. 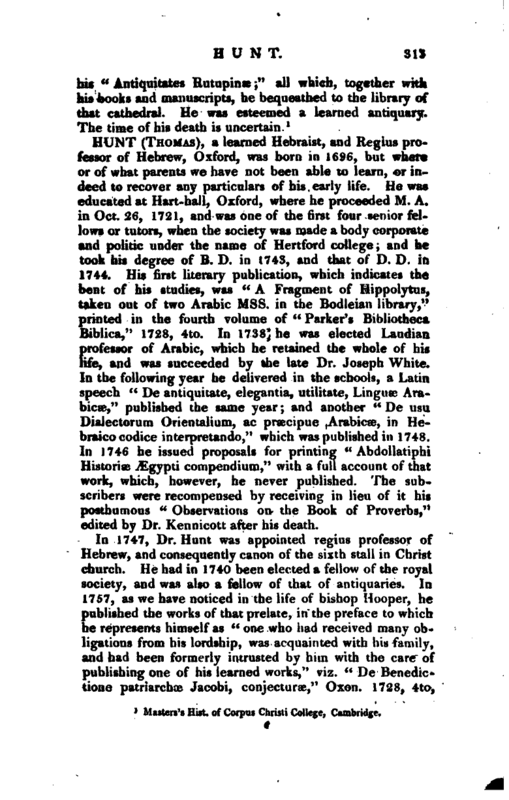 In 1747, Dr. Hunt was appointed regius professor of Hebrew, and consequently canon of the sixth stall in Christ church. He had in 1740 been elected a fellow of the royal society, and was also a fellow of that of antiquaries. In 1757, as we have noticed in the life of bishop Hooper, he published the works of that prelate, in the preface to which he represents himself as “one who had received many obligations from his lordship, was acquainted with his family, and had been formerly intrusted by him with the care of publishing one of his learned works,” viz. “De Benedictione patriarchs Jacobi, conjecturae,” Oxon. 1728, 4to, | by the preface to which it appears that bishop Hooper was one of his early patrons. Of this only 100 copies were printed as presents to friends, but it is included in the bishop’s works. Gent. Mag. LXXI. Doddridge’s Letters. Nichols’s Bowyer. ms correspondence with Dr. Shape, in the possession of the Editor.